Resonant devices such as MEMS gyroscopes can be affected by outside vibration at their resonant frequency (anywhere from 15 to 100 kHz). These outside vibrations can be caused by “impingement events” such as road gravel being kicked up and hitting the underbody of a vehicle. Vibration coupling also causes mechanical crosstalk between neighboring devices in a system, for example when multiple gyroscopes are integrated in a single module for multi-axis sensing or increased performance. Epack’s isolation substrate can be designed to act as a mechanical low pass filter, as illustrated in the plot on the left. The substrate geometry is tailored to place resonant modes for all 3 axes at frequencies (purple) where they will not be excited by vibrations experienced in typical environments such as a ground or aerial vehicles. Epack’s substrate then filters out higher-frequency vibrations near the resonant frequency of your device (red). 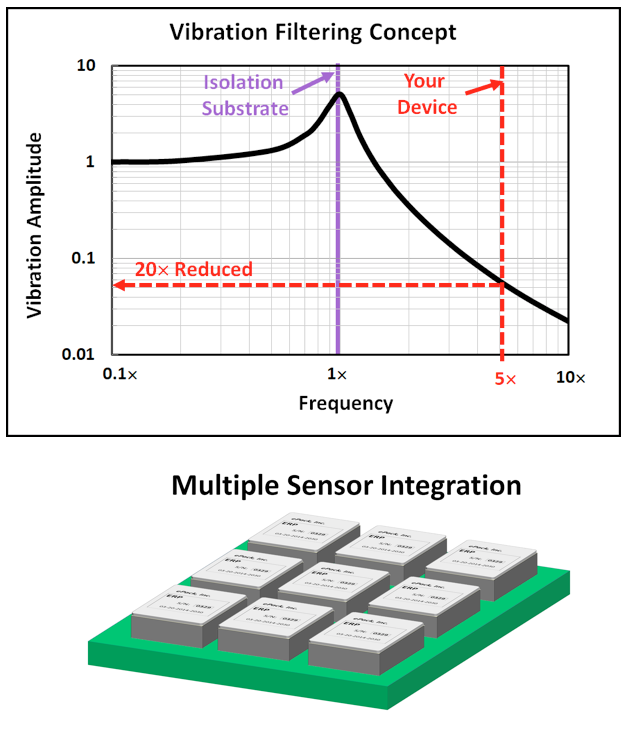 In the example on the left, the resonant frequency of the isolation substrate is designed to be 5× lower than the device frequency, attenuating vibration amplitudes near the device frequency by 20× (95% reduction).